RENOPAK now offers a range of robot palletisers, pallet wrapping and strapping machines, conveyors, case erectors and case packers, by Logimec Industrial Automation. Logimec is an established manufacturer of turnkey systems, including both hardware and software products, that cover a wide range of industrial applications. 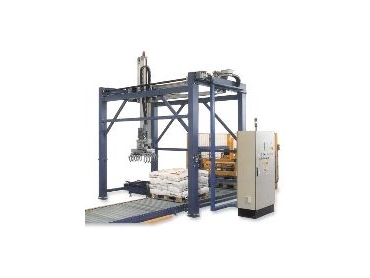 Its signature machine, the automatic robot palletiser, features a robust gantry frame structure with construction possibilities to palletise one or more product lines. The robot's gantry build structure allows it to pick up a maximum of 150 kilograms payload with each cycle. This robot has the ability to palletise different sizes and multi-product lines, at an operating speed of up to 12 cycles per minute. Using customised pick-up grippers multiple product or whole layers can be loaded onto a pallet at each cycle. Because the Logimec robot is manufactured using standard ac motors with soft shaft encoders, there are no expensive components such as servo drives. Combined with Windows-based programming software, this machine is an intelligent choice. Pallet program changes are made simply by entering the size of the case or bag and the number of layers - the software does the rest. The Logimec software is also remote communication capable and can be linked to order picking and shipping scheduling. Combined with RenoPak's Australian designed and manufactured pallet dispenser, palletising problems can be solved.